I presented some visual approaches in an earlier blog called ‘Finding Nemo’ and I am now going to elaborate one of the ideas to show the value of looking at a mathematical structure in different ways. Each of these needs learners to ‘see’ the diagram or expression in one way, and then in another way. This requires more squinting, so I have shaded what you might get after dealing with the first two terms, and inserted some dotty lines, to get you started. A good excuse for colouring-in, for mathematical purposes! 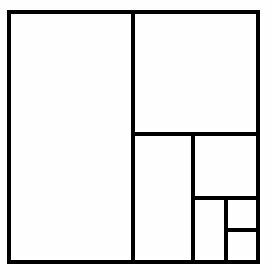 Can you ‘see’ a fraction series that gives two thirds as its sum and is represented by the same diagram? There are various ways of doing it. Now see if you can construct further fraction series sums using the same idea, i.e. using shapes that can be cut into smaller and smaller versions of itself. I can almost hear you saying ‘when do I fit this into an overfull curriculum?’ Deftly handled, these tasks could provide reasons to practise using the formula for sums of infinite geometric series, writing general terms for such series and using Σ. It could also provide interest for younger students who have a negative reaction to having to add fractions, maybe because they have only been taught procedural rules. 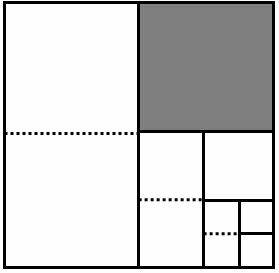 So looking at the same diagram in different ways can open up creative exploration of a mathematical idea. It is currently the case that all students have to learn a traditional long division algorithm in primary school. This is not the place to discuss the pros and cons of this but the algorithm can be used for older students in applications that relate to what we have just done. In my working out I use the algorithm to divide 1 by (1 – r). 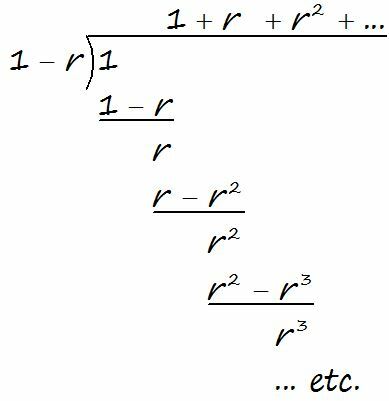 If you substitute ½ for r, or –½ for r, you will get series related to those demonstrated above in diagrams. You also get a context in which two domain restrictions have to be considered: avoiding zero as the divisor and ensuring that you end up with a convergent series. You can also vary the numerator to get the formula. Now that the A and AS-level qualifications are not in modular form, there is more room for students at this level to engage in explorations of this kind that can deepen mathematical understanding and give a connected, more meaningful experience.